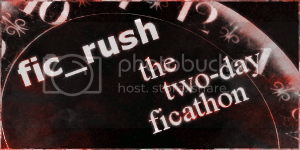 Fic Rush is a monthly, multi-fandom fanfiction marathon. You spend as much as you can of a 48 hour period writing fic, and tell us how you're doing by posting in our hourly check-in threads. It's a great way to push past writer's block or just connect with other authors. This comm was founded on LiveJournal in 2009 by studyofrunning. Since 2010, it has been run and maintained by the current owner, Beth. Simply checking the comm is always a good idea, too. We choose each month's weekend by poll.